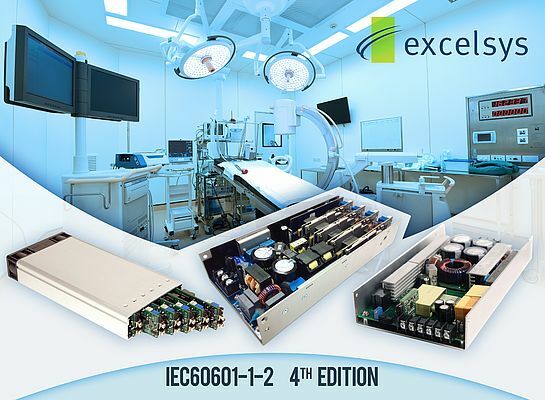 Excelsys Technologies announces that its complete product range now meets the requirements of the 4th Edition (EMC) of IEC60601-1-2 making them all suitable for use in medical applications. The most recent product introductions, including the revolutionary CoolX600 Series 625W convection-cooled modular power supply, and all future products will be designed from their inception to meet all relevant and latest industrial and medical approvals. The designs of the established and very successful Ultimod, Xgen and Xsolo product ranges have now all been reviewed and certified to and meet the requirements of the 4th Edition (EMC). All Excelsys modular power supplies offer exceptional price, performance and efficiencies and are housed in 1U high single, four or six slot enclosures. Fully isolated output modules may be configured by users in series or parallel to provide an off-the-shelf-custom power supply solution delivering from 200 to 1340W output power. In addition, the Xsolo range of single output 500W and 1000W power supplies with PMBus™ digital communications has also been certified to the latest standard. Typical applications include medical clinical diagnostic equipment, medical lasers, dialysis equipment, radiological imaging, clinical chemistry and electro-medicine applications. Customers can use the simple online Power Supply Configurator to specify an application specific product for delivery from stocking distributors worldwide.